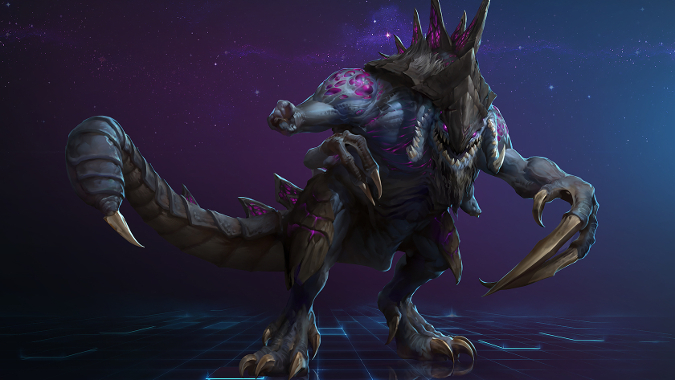 Primal Zerg pack leader Dehaka arrives in Heroes of the Storm next week. His official spotlight displays a character who will undoubtedly establish himself not only as one tough cookie, but a true playmaker — someone who makes wonderful things happen in a coordinated team. Certainly, in Dehaka’s case, a coordinated team is important: his survivability is high but his damage is low and the hero spotlight says as much. This guy isn’t going to be a Li-Ming situation where, when things line up just right, she blows away the entire opposing team with fire and fury. No, Dehaka’s strengths lie in disruption: striking from behind, scattering his opponents, and pulling them out of position for a quick gank. An opposing Li-Ming might have a hard time pulling off those flashes of glory when Dehaka is around. The newest StarCraft Warrior Hero to join the Heroes of the Storm roster brings a whole pack-load of novel gameplay mechanics with him. In place of a mount, Dehaka is able to travel to any patch of brush on the map with his Brushstalker ability. This gives him a constant global presence. Dehaka’s trait Collect Essence, meanwhile, grants a stack of essence any time a Hero or minion dies hear him. The can then consume his saved-up essence to restores health over a few seconds. When used effectively, Dehaka’s essence gathering-and-consuming make him capable of near infinite sustain. Dehaka’s signature ability, Drag, is a linear skillshot. When fired, Dehaka latches his tongue onto the first enemy hit, allowing the Primal Pack Leader to pull the target around briefly. A solid Drag shot can completely isolate an enemy Hero, pulling them out of position and into the waiting arms of your team. Staying true to his zerg form, Dehaka’s Burrow ability plunges him into the ground for a short period of time. This allows him to dodge deadly enemy fire, take a breather, and regain some health with Collect Essence. Or he can pair it with his Dark Swarm ability for some easy damage by burrowing into the ground and becoming invulnerable for a few moments. For Heroic Abilities, Dehaka’s first choice is Isolation, a skillshot ability that slows, silences, and greatly reduces the vision of the first enemy hit for a few seconds. Dehaka’s second choice, Adaptation, converts all damage taken over a few seconds back into health after a short delay. Dehaka’s playstyle is completely altered depending on which heroic you choose—you can either take the aggressive route with Isolation, or become practically unkillable with Adaptation. With either choice, Dehaka is certainly a primal force to be reckoned with.